The Tower of London is one of the city’s best known landmarks. It stands on the River Thames and has so much history, it would be impossible for the “Beefeater” guides to tell you it all! Over hundreds of years, almost every major event in Britain’s royal history has a connection to the Tower. It’s perhaps best known for its uses in Tudor times when Henry VIII and Elizabeth I imprisoned those who were a threat to their reign, and even those who weren’t! The oldest bits of the tower where some of these significant events in British history took place, all still exist and you can feel the history as you’re walking around. Don’t miss Traitors Gate where those who were condemned made their entrance to the Tower from the river – it still has an air of death about it somehow! Today, the Tower of London is the home of the Crown Jewels, which hardly look real and we felt were not anywhere near as interesting as the building itself. 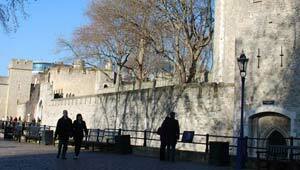 Another thing you’ll notice is the famous Ravens that inhabit the Tower of London. One observation though – on the tour, you’re constantly told that the Tower belongs to the British people – and yet they still charge British citizens to get in! The Tower of London is open from Tuesday to Saturday between 9am and 4.30pm, Sunday and Monday between 10am and 4.30pm. Standard adult admission is £20.90 (2012 prices) with concessions available for children, seniors and students however you can often save money by booking in advance. You can see latest prices and “skip the line” options here.